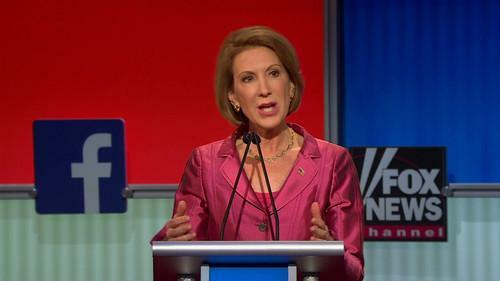 Carly Fiorina speaks during a Fox News Channel televised debate in Cleveland, Ohio, on August 6, 2015. Republican presidential candidate and former tech-executive, Carly Fiorina, has called on Apple and Google to provide greater access to information about their users to the FBI and law enforcement in order to aid investigations. Speaking in a televised debate in Cleveland organised by Fox News Channel, the former CEO of Hewlett-Packard said restrictions that prevent private companies and law enforcement from working together need to be changed. "I certainly support that we need to tear down cyber walls, not on a mass basis but on a targeted basis," she said in response to a question from a moderator. "I do not believe that we need to wholesale destroy every American citizen's privacy in order to go after those that we know are suspect or already a problem, but yes, there is more collaboration required between private sector companies and the public sector and specifically we know that we could have detected and repelled some of these cyber attacks if that collaboration had been permitted," she said. Earlier this year, President Obama called for greater cooperation and collaboration between the private sector and the government. He has proposed setting up cyber threat centers in major industries that would allow companies to share information about attacks and attempted attacks to better insulate themselves. The centers would share some of the information with the government, which would act as a clearinghouse of sorts. But there are potential legal and competitive implications to sharing such information. Currently, companies rarely disclose details of attacks unless they are required to do so by law, which means the vast majority of attacks on U.S. companies are thought to go unreported. New laws that would allow greater sharing of such information are currently working their way through the US Congress. Fiorina was asked by a moderator if she would call on Apple and Google "to cooperate on these investigations and let the FBI in where they need to go." "I absolutely would call on them to collaborate and cooperate," she said. Access by law enforcement and other government agencies to the private correspondence and online activities of millions of Americans has been hotly debated since details of secret surveillance activities were leaked by former NSA contractor Edward Snowden.